My close friend runs an amazing personal training business. She’s smart, funny and in the best shape of her life, which I can honestly say since I’ve known her for nearly 20 years! She recently put up a post that got me really thinking about being defeated before we even begin to get in shape, and these are my thoughts, my “fat story”, my reasoning on the matter…I really want to get to the bottom of things, because as she says in her blog, losing the weight is great but you need to figure out how you ended up in this spot to avoid it in the future. So, on that note…meet the teenage me. As you can see for yourself, I obviously never struggled with a weight problem. Here I was probably at 120 at the most. I was young, active, and didn’t have to work hard to stay in shape. In fact, at that point, I thought eating healthy was only a step up from ripping your nails out as far as fun ways to spend Saturday nights go, and I never worked out unless you count horseback riding once in a while. I was a size small and didn’t think twice about it. But, with all of that said, the truth is I still didn’t like my body. 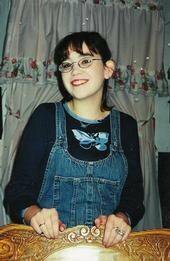 I had a tiny bit of belly bulge that upset me, and I never wore shorts or skirts above the knee because my legs were “ugly and jiggly” (I can still remember saying that over and over). I was so worried that my arms would end up being ugly when I got older, because I already hated their shape. I gained a little bit of weight over the next few years due to heavy drinking and less activity and more eating. When I got married in 2000, I was 19 and weighed about 130 pounds. I decided to lose weight after the wedding. I lost weight alright…I got pregnant in June of that year. I ended up with a pregnancy disease called HG and within a matter of three weeks went from 140 to 117 pounds and a hospital bed. A week later I was down to 98 and in a nearly comatose state. When the HG finally went away, I was thrilled, but something had been triggered by being so close to death and out of control. It was the trigger that knocked on my emotional disorder’s door and brought it to the forefront. I covered a lot of this, including my exact diagnosis, in this blog, so there’s no need to go through it all again right here. But the fact was, my mental health totally overrode all of my physical health concerns. There were days when I absolutely could not force any food down, and if I did, it didn’t stay down; there were other days when I overate and over drank to the point where I almost couldn’t move! That, added to the different medications the doctors were trying me on to see what would be the most beneficial to my condition, sent me on a tailspin that brought on a huge weight gain. At this moment I weigh 170 pounds. I gained most of that weight during the first year after my panic attacks and anxiety disorder started. So now, I’m feeling really stuck and resentful of this body. I still take medicine to help maintain a level chemical balance, and have been in therapy for close to seven years, which has helped tremendously. One of the things I’ve realized through all of that is that I do like being heavy. To me, it’s a protection. I don’t want to deal with people. Sometimes I don’t want to deal with life in general. It’s easier to disappear if you’re considered an outsider, and being fat usually makes you an outsider. I also don’t have a healthy relationship with food or working out- I tend to either over or under do them both, and use them as punishments instead of fuel and help to feel good and be happier. I have all of these reasons why I got in this spot, and even a basic understanding of why I’m having so much trouble sticking to this clean eating plan and healthy working out plan. but I just can’t seem to give myself that push I need to get started again. I’m terrified of failing at this – again – and also terrified of succeeding and “coming out of hiding”! So what’s the answer? The answer is simple but complicated. I have got to change my thinking. About myself, my body, being skinny, being fat. I need to take out the negative thinking (All fat people are lazy, and I’m fat, so I’m lazy of course) and learn to have realistic expectations (I’ll be so happy when I can fit into a size 3 again, I’ll never have another panic attack or depressed day again!) I’m an all or nothing person, so I have to learn to be balanced about this. It’s going to take time, but the best way to get started is to just do it. So I’m setting goals. Rather than going by a week or monthly schedule, I’m going to do a 21 day goal. I read somewhere that it takes 21 days to make something a habit. I’m not sure if that’s scientifically accurate, but I like that length of time – doable, long enough to allow for beginner’s burnout, short enough to not forget the urgency of the situation and keep focused. Eat two healthy meals and three snacks every day. That leaves me room for improvement during the next 21 days but gives me something attainable now. Anyone else want to set some 21 day goals? IF I can do it, you can do it…just jump in and start! Want awesome free stuff? And a new favorite blog or two? Flamingo Toes is one of my all time favorite blogs. Hands down. She has an amazing Etsy shop which is full of awesome rings, necklaces, bracelets and even a pattern for a great purse. But we don’t always have a ton of extra money for shopping online for pretty things just because we love them…so wouldn’t it be better to win some stuff instead? Of COURSE! Which brings me to my new favorite blog – A Glimpse Inside. That’s where I got that nifty button up there at the top of this post. Isn’t it great? So if you head over there right now you have a chance at winning $25 worth of shop credit in one of the coolest Etsy shops ever. I can’t figure out a way to add this button to my side bar right now, and I’m too fried to figure it out at this moment, but I realized tonight that I had never mentioned my background change or where I got my image from. So I wanted to correct that as fast as possible! So just where did that awesome bird collage come from? Well of course…it came from the awesome blog, The Graphics Fairy! 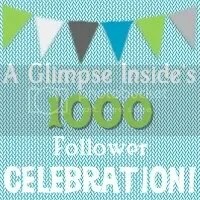 Go check it out – she is AMAZING and has great images and blog goodies that she very generously shares with all of us. On a quick personal note, we still don’t know where we’re moving, we have spent way too much time in UC Davis Children’s hospital with extended family members and the end result is horrific, and I am no longer even pretending to try to sleep at night. I’m just doing whatever I can to get through these days right now, because if I stop and think too much about any of this, it gets very overwhelming, very quickly. Also, I have been able to craft a bit here and there but have not been able to get pictures…I’m working on it! Amid all the chaos flying around right now, crafting and haunting my favorite blogs has been a great source of relief in the moments I can grab to have to myself! Tomorrow (later today?) I am getting back on track with my cardio routines to try to control this stress…will let you know how it goes!! Mayday! Houston, we have a problem…seriously. So at some point last week (I think?) I posted about moving (I’d go look for that post, but that requires energy and motivation, both of which I’m lacking in my life in huge amounts. Deal. Also, I could have posted this on my fb instead of here, which would make looking for that post a waste of time, energy and motivation. Not gonna happen.) back up on the hill (oh yeah! I did post it here! Just reminded myself…enough with the parenthesis.) Anyway, I was all upset/excited/dramatic about it, both in the post and in real life. I went and bought – yes, bought, rather than haunt grocery stores and begging my neighbors or the homeless for theirs – boxes at 11 PM. But, because I’d rather act dramatic than actually do anything productive, I never started packing. The whole house-on-the-hill deal fell through in a huge way. Remember my rant? Let’s just say, I was right to write that, and would have been more right to remember those feelings instead of making the same dumb mistake again and trusting the person that was written about. Which, now that I am done being bitter and resentful (you can tell I’m over it, right?) I am actually thankful for…can you imagine if we’d done all the packing and hauling and moving and then this had happened? Yeah…I would not be a happy camper…and probably have even more bitter resentment built up! But the complications have only just begun. See, when we were planning on moving back on the hill, I felt really bad about leaving our awesome landlady without renters. It worked out well that I wanted to find replacement renters, because two of my sisters decided they love my house so much they want to live here too, and rather than fight about who’d get it, they decided to become housemates and rent it in our place! Yay, right? This whole plan was obviously concocted before our moving plan fell through. 30 day notices were given…I got all excited to declutter and pack and move…and then everything changed. Now, I have two sisters who need to be here by August 10, and I have no where to go to get out of their way. So, yeah. You can understand the title of this post now, right? The thing is, you’d think I’d be totally stressed and freaking out and overreacting and yelling a lot, since I really am so dramatic. One of these times I might actually believe myself. Usually, though, I just picture a huge jet airplane falling out of the sky with a smoke trail behind it, and I feel a little better instantly. Because I’m not on it. Not literally. And I’m not bitter or resentful, either, which helps considerably. So a few years ago my husband and I lost our house to foreclosure. We’d been living “up in the hills” as everyone calls it, in a small rural town with two stores, four gas pumps and a pizza parlor. We loved our house. We had five acres, twenty six pygmy goats, three horses, and even an emu. We loved our house and land so much that we actually got married (for the second time) in the back pasture behind the beautiful barn. We loved it, we lost it, we moved on. When we moved “off the hill”, I was heartbroken. Honestly. We’d signed a bad loan, for good reasons, so the foreclosure didn’t strike the same internal chord with us that it seems to have hit so many others who’ve lost their homes. We never felt angry with the lenders or that the situation was unfair. But, that didn’t mean we were happy with it, not at all…we just accepted it, but it still hurt, a lot. When we left we both decided we’d never live on the hill again, and never wanted to try to buy another house. We’d be renters in town and be content. Life changed for us six months ago when my mother in law passed away. Now, as a result of that, it’s about to change again. One thing that has to be said about that woman was that, as amazing and incredible and intelligent as she was, she was definitely human and had human flaws. As a child of the Great Depression she developed a seriously astounding pack rat habit in her older years. Although we were all aware that she was sick, no one was convinced she was going to pass away, not even the doctors. Everyone kept expecting her to get better. So we put off going through her things and sorting them out because we were waiting for her to feel better so we could all do it together. That’s not the way it worked out, and now my father in law is stuck dealing with a stuffed house, beyond stuffed shop, and sheds and yards and a green room…it’s all very overwhelming. Nothing my mom had could really be considered trash; she didn’t save garbage (for the most part) but she did save everything else. Now, my dad needs to sell what he can sell, including the shop and house, to start over in a fresh place. But he can’t deal with everything that’s there on his own. It’s very tempting to bag it all up and throw it away, but the thing is, there is plenty of useful, needed stuff there. We need to sort it with the family, give them what they can use, donate what we can, and throw away what we have to. To do all of that is going to take time and energy. But when we’re driving half an hour each way to get up there to help him, then rushing back home after a long day to take care of our own house, there isn’t enough time or energy left to deal with anything properly. So we made the decision to give up our house (which is a rental, and which I am glad about leaving before winter, honestly) to stay with my father in law long enough to get rid of everything up there. The ultimate goal is for us to find a house to buy together, but for the moment I can’t even begin to think of that…it’s very, very overwhelming. So we are moving into an overly furnished house…to clean it out and empty it…to move again eventually. Overwhelming? Temporarily insane? They both apply to this situation! There are benefits, one of the main ones being that since we are leaving this rental, my two sisters have decided to move into it and our landlord is thrilled. That means that I don’t have to pack up my kitchen to move it into an already overly equipped one…since neither of my sisters have very much in the way of furniture or practical things, I’ll be able to walk away with only my favorite and needed personal things. That in itself is scary! I have started over with nothing three times in my life, and for some reason, this feels like another time. Maybe because it’s not my own stuff I’ll be surrounded by? I’m determined to keep the things that are most dear to me, and will be getting a storage if I have to, since eventually we will be moving to a bigger house and I’ll have room to spread out; on the other hand, I’m looking at this as a chance to shed anything that’s unnecessary or in the way. I’m enjoying the prospect of a fresh start! What about you? If you could pick up tomorrow and move with only the things you love, what would you take? How much of what you deal with every day, from clothes to dishes to decoration, is stuff you just keep shuffling around because it’s there? I am going to try my best to only take what I love and let everything else go…is there room for you to do that in your life as well? But I wanted to share my newest obsession! See, I do think of you guys, all the time. My sister Katie found this for me and I love it so much I’m sharing here. It is AMAZING. 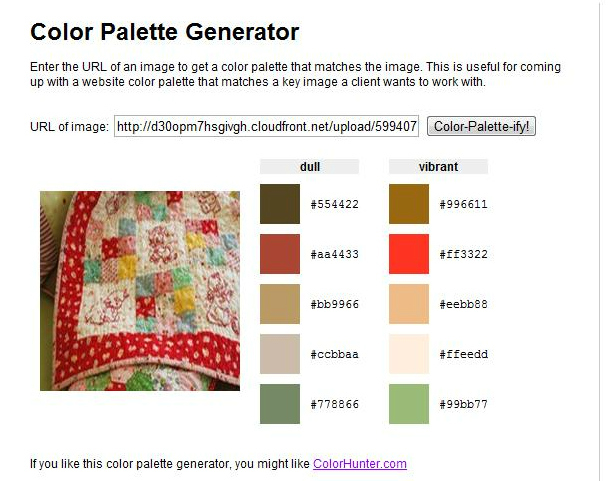 You can define a color palette for your blog, quilt, redecorating or any other kind of project where you’re using color – just copy the URL of the web-hosted image, insert it in the generator and click Color-Palette-ify. So fun! It’s called the Color Palette Generator and it is a total blast. One of the best parts is that you can do this directly from Pinterest without opening the picture in its blog, very convienent! PS – to find the image URL, right click and select Copy Image Location, or in Windows 7, Copy Image URL. Hi guys! I know I’ve been gone again for a while. I am thinking about setting another challenge for myself like I did in April (ignore the blog title, I’ve since changed the layout of my blog and hidden the calendar, ha ha) . I think I’ll wait until July 1st so that I have a whole month to blog daily. In the meantime, I wanted to share some of the pictures I’ve taken this summer. Enjoy! PS – sorry these pictures are so small. Apparently WordPress is smarter (or more stubborn) than I am today! I get it. There are mean people in this world. That’s common knowledge and not a surprise to me at all. You see mean people every time you turn on the news and some mother killed her kid, or an innocent victim got shot by a gang banger, or some politician or super famous actor was recorded cussing, ranting, threatening, etc. in some extremely crazy way. Meanness is not a new concept. But it is still a concept I will never get used to or expect or accept. Especially when it comes to family. If you can’t trust, love and or respect members of your own family, there is a serious problem somewhere. Also, if you are one of those people who’s feet ‘run to do badness’, you should really sit down and think about why you’re doing it and how to stop it. If you can’t get it under control the least you could do would be to remove yourself from society and leave the rest of us alone. I am not talking about your average I-had-a-bad-day-and-took-it-out-on you meanness, either. I’m talking about years and years of totally cruel and unusual hatred for those around you with no basis for that feeling except that you are a horribly selfish person. If you can’t make the effort to be decent to the people around you, if you’re reading this and thinking that maybe I’m talking about you, you really need to figure out a way to be better and change, because one day you’re going to look back on your life and realize what a terrible person you have been. You’ll turn around to apologize to those you truly love, who you truly hurt, and in that second the truth will hit you smack in the face – you’re completely, utterly alone, and deserve to be. And that, my friends, is my rant. I’ve spent the better part of this day locked in my sewing room. There are two reasons for this – one, my kid is sick and grouchy, so I’m trying to stay out of her way as much as I can; and two, I’m really trying to work harder at being a good blogger and crafter. To that end I took some pictures and edited them for use here on my blog. If you like them, you can use them however you want. They are bigger if you click on them. So click on them and choose ‘save image as’, name the file whatever makes your little heart happy, and it’s all yours! It would be awesome if you’d take the time to drop me a line and tell me how much you adore my wonderful images (lol!) or at least give us a link to your blog so we can check it out. But, it would just be awesome…it’s not a rule or anything! Oh, and one more topic of discussion – this blog has gotten pretty messy with diary entries and whining posts and not enough pictures or good crafting content. But, I’ve had this up for almost five years, and there are a lot of posts to go back through and edit and reorganize. I’ve been really horrible about tagging things correctly, too, so it’s really hard to find anything, and gives me a headache just thinking about it, honestly. So, what I am thinking about doing is moving over to Blogger for my crafting posts. (Yeah, I tried that once before, a few years ago, but I wasn’t really focused enough to put in the effort needed and eventually gave up. Not gonna happen this time.) There are a lot of pluses to Blogger but the truth is I really am having a hard time being disloyal to WordPress after this many years here. So I’m still just in the ‘considering’ phase. 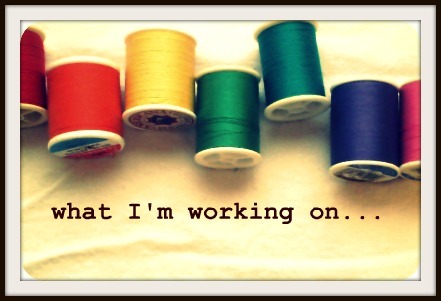 The other option is to stay here at WordPress and just start a new blog for my crafting stuff. I’ll still post here either way, about my fitness and life and stuff, but…Idk. It’s just something to think about. What about you? What are you thinking about today? Share with us…we want to know!